I’ve really missed being part of a newsroom this week—the drama, the camaraderie, the storytelling. When the bombs exploded on Boylston Street, I kept waiting for my iPhone to vibrate with orders to head to the finish line with notebook and pen. Instead, I remained on the couch, a passive consumer of the news breaking on the three screens before me. The following day, I read accounts of Globe, Herald and Times journalists who had taken the day off to run the marathon only to find themselves reporting from the frontlines in their running shoes—some taking notes on bar napkins and filing stories on borrowed cell phones. And the stories they were telling- oh, the stories! Stories of heartbreak. Heroism. Humanity. Stories that write themselves! And here I was on the couch, hostage to a bad cold and the 24-7 local TV news coverage, which was growing more sensational, erroneous and repetitive by the minute. So I turned to Facebook and surprised my Friends with more status updates in a day than I had posted in a lifetime. Most of these updates related to my husband’s work as the pastor of a downtown church just a block away from the crime scene’s eastern-most boundary. The noontime prayer vigils had attracted media attention resulting in a beautiful photograph of Rob lighting candles in memory of the victims (John Tully of the Wall Street Journal) and a snarky Slate article by Justin Peters who likened Rob to Hollywood actor Bill Pullman. This provoked a lively debate on Facebook. While on Facebook, I helped break the tragic news of the third victim’s identity to some of my fellow BU grad students, who were confused by the vague and mournful status updates from our Chinese classmates that popped up Tuesday evening. In keeping with the wishes of the victim’s family, BU administrators would not release the student’s name, but the Chinese media did, and so our classmates knew before the rest of us that their friend, Lingzi Lu, was dead. To help clue the rest of us in, I found and posted a link to a Globe story naming Lu. In my virtual newsroom, I was not only breaking news but reading and reflecting on it thanks to friends and former co-workers who posted links to the best stories and praised professional news organizations for their “thoughtful” and “well-reported” coverage of the bombings. Someone posted a Wall Street Journal story written by a reporter friend I had lost touch with. We reconnected through Facebook and I learned she was here in Boston, camped out at MGH. We made plans to meet for dinner, which got bumped when the FBI called a press briefing. 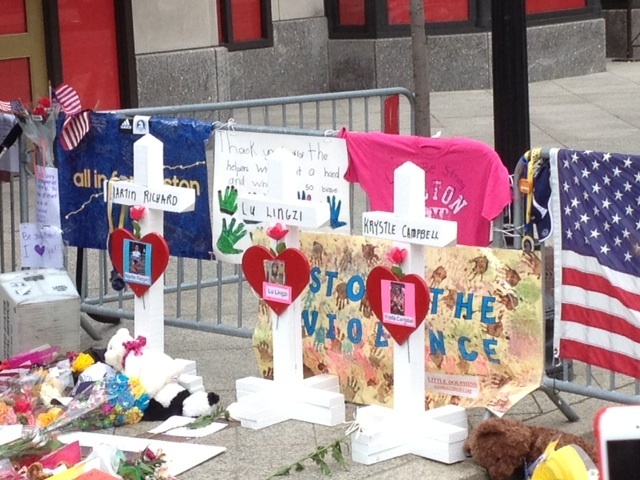 Today, I left Facebook and the couch and made a visit to the sprawling memorials at Boston’s Ground Zero, where hundreds have left flowers, marathon medals, running shoes, stuffed animals, crosses, flags and messages of hope and strength for the city and its fallen. I lunched with friends at a crowded sidewalk café on Newbury Street. As my hands rested in my lap, I was newly aware and grateful for my limbs and the heavy police presence that covered each block. I saw reporters with their notebooks and pens in hand, combing the streets for the stories that will continue to write themselves. I didn’t have a notebook or a press pass, but I had my iPhone and documented what I could to share with my Friends when I got back to the newsroom. What a great blog! Thanks for sharing, sis. You truly have a gift with the word…. Blessing, peace and love! Great to hear from you again, Becky – so much coverage, so much anxiety to ‘get news’ becoming confused with ‘making news.’ You are a voice of reason.